Additional Info – The three parts of the runstone were discovered in the summer of 1991 during repairs to the churchyard wall. The stone is most likely one mentioned in documents dating from the 1600’s from Norrsunda parish. It must have been close to modern Vallstanäs. The stone material for the wall building come in part from a demolished building in that area. It is unusual that the dead son isn’t named. That might indicate that this is only one stone of a ‘pair monument’. The unusual man’s name, ‘Häming’ can also be found on runestone U431 in Norrsunda Church. 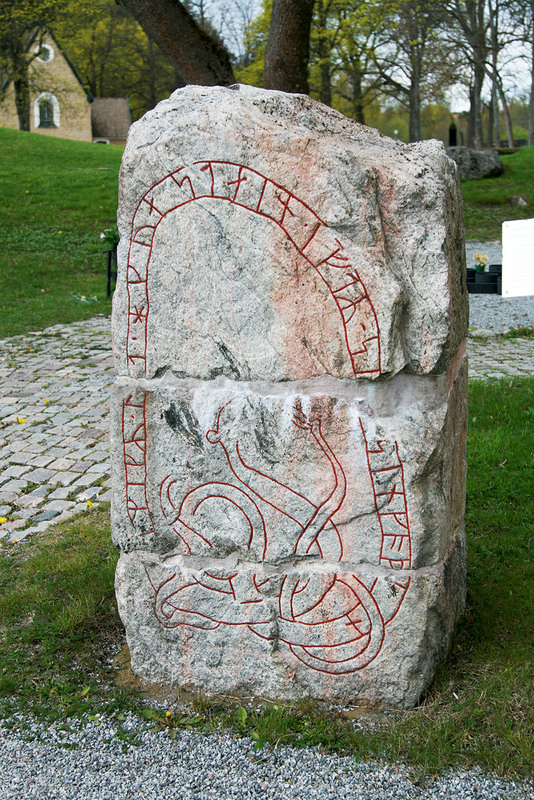 The inscription on it reads: Rova and Häming let be raised these stones after Gunnar, their son. But he has died out among the Greeks. God help his soul and Mother of God.” It might be this is the other of ‘these stones’ raised in Gunnar’s memory.